The application of GIS-based systems to agro-climatic analysis under current climate conditions has already been outlined. The availability of a range of GCM outputs run under a suite of emission scenarios is now permitting similar approaches for potential future climates. With any such approaches it should always be borne in mind that outputs from the GCMs are not precise and variation occurs between different models and scenarios. In addition, for agricultural assessments downscaled GCM results are usually required and this introduces another set of uncertainty. Despite these caveats, the results of such studies can provide useful indications of the potential magnitude of change and the spatial variation that may occur. Selected examples are given below in order to illustrate the range of approaches being undertaken. Tools such as FloraMap™ and Homologue™ have provided a useful means by which environmental niches and priority areas for wild relative diversity can be identified. Incorporation of future climate data into such tools is providing indications on how the environments supporting wild relatives might change. Using FloraMap™ with HadCM3 model data, Jones and Beebe (2001) looked at predicted wild bean environments in Central America in 2055. Their conclusion was striking: in five out of the seven countries studied, the results indicated the virtual disappearance of suitable wild bean habitat by 2055. Jarvis et al. (2001) used a similar approach for wild Arachis species (the closest relatives to cultivated groundnut) in South America. Again the predicted scenarios for 2055 were striking: 12 out of 17 species were predicted to go extinct and four of the remaining five likely to be dangerously threatened. A comparative study of wild relatives of groundnut (Arachis), potato (Solanum) and cowpea (Vigna) under future 2055 climate scenarios reported similar results: high extinction rates, decreased range sizes and increased fragmentation of environments (Jarvis et al., 2008). Such analyses have raised awareness of the potential threat posed to wild relatives and the subsequent loss of important genetic diversity. Use of GIS has allowed graphic visualization of the decline in suitable environments, highlighting where the major effects might occur and providing a quantitative assessment of fragmentation patterns. The previously described mega-environment concept used by CIMMYT captures crop-stress related information. Heat stress is an important yield-limiting factor for wheat and this is captured in one of the mega-environment definitions (ME5). 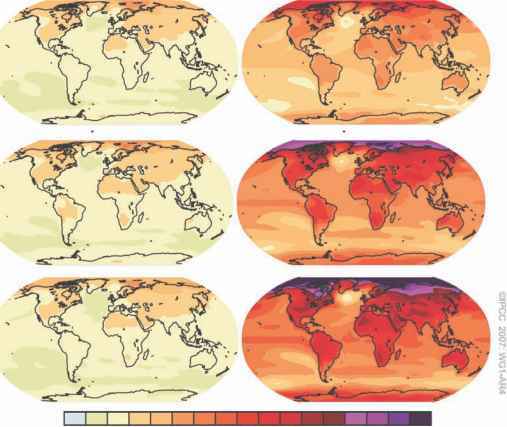 Redefinition of the mega-environments based on future climate data derived from the CCm3 model (Govindasamy et al., 2003), indicated substantial potential expansion of these lower potential heat-stressed environments in South Asia by 2050 (Hodson and White, 2007 - see Fig. 13.3). Subsequent incorporation of additional GCM data for 2020 (from HadCM3, CSIRO and CCCMA, the Canadian Centre for Climate Modelling and Analysis) also indicated a similar considerable expansion of heat-stressed wheat production environments. Drought stress is another major concern under climate change. The failed season model previously described provides a framework for looking at future scenarios. Using the HadCM3 A1 scenario for 2050, Thornton et al. (2006) illustrated the potential shifts in frequencies of failed seasons within sub-Saharan Africa. Results obtained indicated a quite dramatic increase in the probability of failed seasons across the agricultural regions of Africa. Embedding the model within a GIS environment permitted clear visualization of the shifting spatial distributions. Changes in the distributions, species composition and timing of occurrence of agricultural pests and diseases are other factors that will undoubtedly respond to global change, but as a result of complex dynamics between hosts and pests and large variation in pest response to climatic conditions and CO2 levels, trends are difficult to predict. In broad terms, warmer more humid conditions usually favour insect pests and diseases. Models such as climex provide opportunities to determine suitability indices for particular species under future climate scenarios (e.g. Sutherst et al., 2000). Jones and Thornton (2003) used csm-ceres-Maize to examine impacts of climate change on maize production in Africa and Latin America to 2055. Using GIS, they excluded non-maize regions and assigned soil data to each pixel associated with weather data. The simulations considered four maize cultivars varying in growth duration, and planting dates were assigned based on mean onset of the growing season. Only 50 kg N/ha was applied so that results would correspond to low-input, smallholder farming. The results suggested that climate change would reduce yields by an average of 10%, but with important regional variation, especially in mountainous areas. A common concern in climate change studies is how sensitive projected impacts are to projections for increased greenhouse gases and to the GCM used. Masutomi et al. (2009) compared projections based on differing Special Report on Emissions Scenarios (SRES) as used in 14-18 GCMs, using rice production in Asia as a test case. In the 2020s, all scenarios agreed that the yield-reducing effects of climate would be large enough to offset possible benefits from elevated CO2. Yield variability also increased with rising CO2. Overall, the results confirmed that while estimated impacts varied depending on the SRES and GCM, trends were consistent in showing that production will be likely to decrease while yield uncertainty increases. Easterling et al. (1992) examined adaptation options with notable detail, considering planting dates, N levels, and the possibility of introducing a fallow. Their paper also stands out because potential adaptations were selected based on input from experts. Of 21 potential changes, however, only ten could be simulated with the epic model. Earlier planting, longer-season cultivars and furrow dyking would reduce the impacts of warming. Beyond adaptations for single crop species, of course, one can compare how different crops or crop sequences respond to climate change (O'Neal et al., 2005; Thomson et al., 2006).